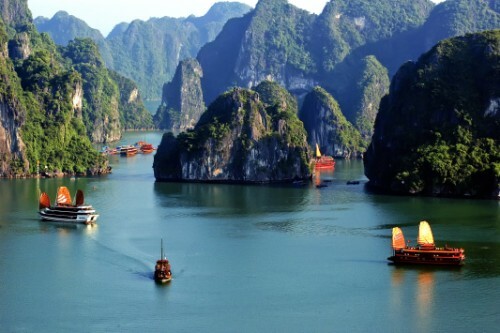 This amazing Vietnam travel tour has all Vietnam's top attractions – Old historic Hanoi, amazing Cu Chi tunnel and 4 UNESCO natural and cultural heritage sites: Fascinating Halong Bay, romantic Hue, charming Hoi An and Mysterious My Son. Limited offers for the best of Vietnam travel tours. Trip name: Majestic Of Vietnam. Trip Code: VNPT - 01( + Departure date). Length of the trip: 10 days and 9 nights. Trip type: Private & Daily departure. Trip starts and ends in: Hanoi City. Trip ends in: Saigon City. Required booking time: At least 20 days in advance for individuals and 45 days in advance for group. On arrival at Noibai airport, pick up and transfer to your hotel in Hanoi for overnight. Take a morning visit to Ho Chi Minh Mausoleum, the presidental palace and his stilt house in beautiful botanic garden. Then, see one Pillar Pagoda with unique buddhism architecture(built 1049) and Temple of Literature(First University built in 1070 AD). Drive to Hoi An over Hai Van Pass with the magnificent view of the China Sea. Visit the fascinating Cham Museum and the Marble Mountains. Then, drive to Hoi An, a charming town offers great time for your Vietnam vacation. It was one of major international ports in South East Asia for early Western traders. You can find its special old-world retainings. Drive through the typical countryside in South Vietnam to Cu Chi district with some stops for photos. Visit a rice paper making factory at Tan Phu Trung Village. Discover the underground village of Cu Chi guerrilla fighters, a network of tunnels built during the long years of wars. Continue to drive to Tay Ninh for a visit to the incredible Cao Dai Temple where all the major faiths of the world blend together in a unique religious cocktail. Attend the noon time service with photo opportunities during the ceremony. Lunch is at a local restaurant. Drive back to Saigon for overnight(Meals: B/L). Free at leisure until transfer to the airport for flight back home. Now, your Vietnam vacation ends. Book this amazing Vietnam travel tour for unique experience of your life travel. If not fully satisfied with the trip, you will have money back. Limited offers.